It's no secret that silver tarnishes. A lot of folks out there prefer white gold because it is not prone to tarnish, and therefore less maintenance. I feel that silver is a gorgeous metal, more pure and honest than white gold. I like that it has character and coloration as it tarnishes. It grows mature, and it can do so gracefully and beautifully if you follow a few simple rules. 1. if you are not going to wear silver jewelry frequently, store it in small ziplock bags. Tarnish is a reaction of metal and air. If your jewelry is stored in a sealed container, it will inhibit tarnish. The only exception to this rule is pearls. I'm not talking about a tiny pearl accent, but if you have a large pearl centerpiece, or a silver pendant on a strand of pearls, these should never be kept in plastic. Pearls are organic material, and they need to breathe. They turn yellow and brittle when kept in plastic for long time. 2. Do not keep your jewelry in the bathroom when you take a shower! The moisture in the air accelerates tarnish! 5. Clean your jewelry occasionally. You might not notice it, but your jewelry gets gross! bits of food, skin, lotion etc. can get stuck especially behind stones in your rings. Clean that stuff! It just takes some soap and water and a soft toothbrush. Always rinse thoroughly. For a really deep cleaning, visit your local jeweler (or me!) and ask them to clean it while you look around. Most jewelers offer cleaning as a free service, even if you didn't buy the jewelry there. They may also offer to remove tarnish by dipping the jewelry in a chemical tarnish remover. Be sure to mention whether or not you wish to have that done. You can also do this yourself. See previous article "How to rejuvinate old silver jewelry." That's all it takes! Silver is a quality precious metal, and it will last you a lifetime if you follow these few simple steps. Last week, when my own sister brought me a bunch of "old" jewelry that she was going to "throw away" it really made me realize how the proper care for jewelry is relatively unknown to most folks. She gave me a handful of perfectly good jewelry which had been tarnished. The tarnishing happened so slowly, I think she was uncertain as to why the items didn't hold the same beauty as they once did. She determined that the necklaces and bracelets were just no good anymore. How Sad! I was floored that she didn't know that the tarnish was removable, and the jewelry could sparkle like brand new! Silver tarnishes slowly over time. Tarnish is a layer that builds on the surface of silver when the air reacts with the metal. The good news is that there are many ways to remove the tarnish! I find it easiest to purchase Tarn-X which sells for 6.99 at Walgreen's. You can put some in a container and dip your silver jewelry in it. The chemical strips the tarnish right off silver! You may need to dip the jewelry a few times to get the full effect. After that, rinse thoroughly and pat dry with a towel. Do NOT dip pearls, amber, coral, or treated gemstones (like mystic topaz or titanium druzy) in Tarn-x! That is the only restriction. These materials may be damaged by the strong chemical. Most other gems will not be effected by the chemical. After your jewelry is looking sparkling and new from the Tarn-x, you can brush it with a soft toothbrush and tepid, soapy water. Rinse thoroughly again. Lay the jewelry on a towel, and pat dry with another towel. Air dry the jewelry overnight to insure that it is not stored with moisture in the crevices. Moisture accelerates tarnishing on silver. Do not keep your silver jewelry in the bathroom when you are taking a shower! This also accelerates tarnish. If you will not be wearing the jewelry frequently, it should be stored in a plastic zip-lock bag to inhibit tarnish. Items that you wear regularly remain relatively tarnish-free because the metal is somewhat polished (actually burnished) by rubbing against your clothes and skin. Philadelphia, PA – August 10, 2010 - Local jewelry designer Layne Freedline of Layne Designs (www.LayneDesigns.com) was recently honored as a Top 10 Copper Circle Finalist in a national annual competition for emerging designers. 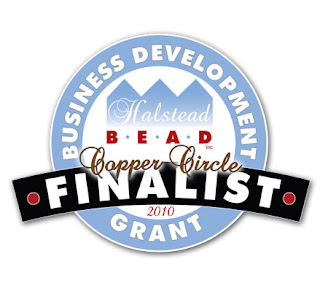 The Jewelry Design Business Development Grant program, sponsored by jewelry supply wholesaler Halstead Bead Inc., awards cash grants and valuable business plan assistance to jewelry entrepreneurs. Freedline’s style is bold and bohemian with a natural feel drawing inspiration from favorite artists such as Hokusai, Erte and Revere. 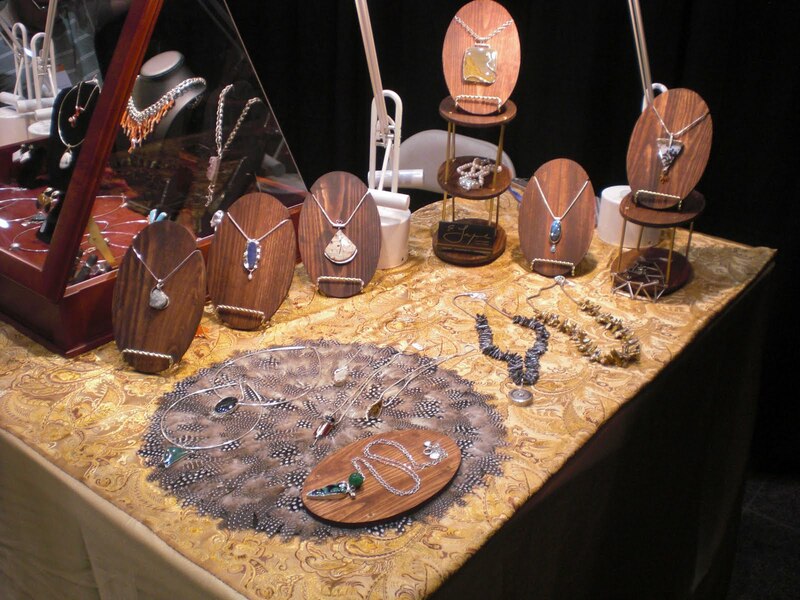 Her passion for gemstones such as lace agate and druzies motivates many of her designs while her innovative work with silver and gold marks her pieces as progressive and quite unique. 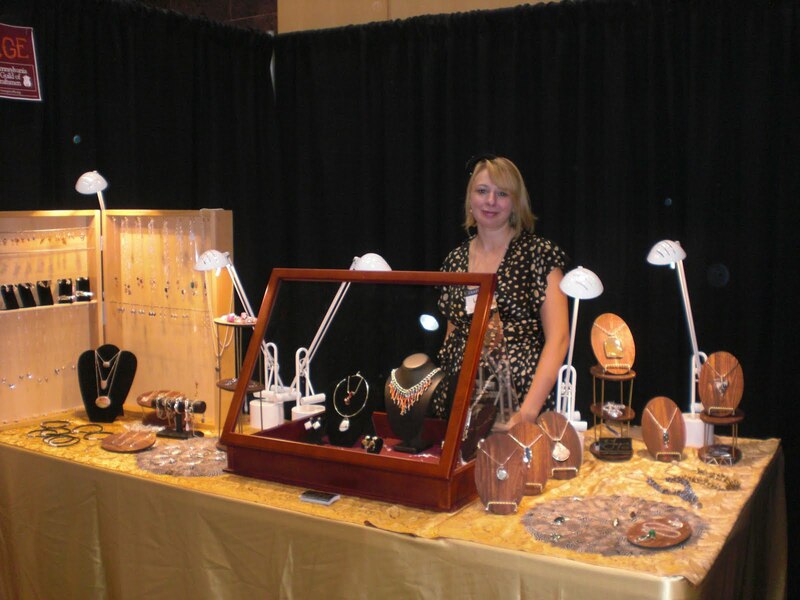 Layne received her bachelor’s degree in Jewelry and Metalsmithing from Temple University and completed several apprenticeships before opening Layne Designs (www.LayneDesigns.com) in 2008. Her designs have been honored by and published in Jewelry Artist Magazine, and she was honored by the PA guild of craftsmen as one of this year's best emerging artists. Entrants in the competition were required to submit a design portfolio, business plan details, and written answers to several specific questions. The program is designed to support the dreams of talented jewelry artisans and encourage sound business practices as they build their small businesses. Detailed results and more information on the award are available at www.HalsteadBead.com/Grant. I can not say enough about what a great show experience I had at the PA guild of Craftsmen fine craft show this weekend. The guild has built on nearly 70 years of experience in promoting and nurturing fine crafts in Pennsylvania and surrounding areas. The show in Wilmington last weekend was gorgeous. The Chase center on the Riverfront was a top-notch venue with excellent staff and security. I was drawn to participate in the Guild shows because of a new "emerge" program that is in it's very first year. The emerging artists who participated (including myself) had booths all in the same section, and it was great to see so much fresh new work. The program has generated a great deal of commotion, press coverage and new energy in in the guild. I was pleased to take part in a meeting of members discussing the future of the guild. I was so interested that the organization was taking the time to get feedback from their members, and to embolden themselves with brave new ideas about how to bolster the art and fine craft market. Another topic of discussion was the "handmade movement." I quote it because, nobody knows quite the word for it. Many phrases are being coined by different organizations: Buy Handmade, Always Handmade, Give Handmade, to name a few. We are all interested in finding the phrase that will take off as the name of the handmade movement. Please share if you have any ideas. The ideals behind this movement are both personal and socio-political. Buying handmade is good for your local economy, spending your precious dollars in a small business environment where the money will continue to be circulated in your immediate area. It is good for the environment to purchase something handmade rather than something pumped out in a factory. It is good for your community to have small studio businesses and handmade shops. It is good for your soul purchasing quality goods with personality which were made with human hands. Bravo, PA guild, for a great show and great leadership. For making a stand for the arts, for spreading the love of handmade goods to a diversity of people. Thanks for being encouraged and invigorated by change and youth. And thank you for starting up the emerge program and making everything easy and digital for artists (I know it's not easy to do).